CTI Electronics specializes in the expert production of metal oxide varistor products. We can supply a wide range of safety capacitors meet and are certified to applicable international safety standards of total eight countries. Our metal oxide varistor product quality is reliable and certified by UL, CUL, VDE, NEMKO, ENEC, CQC, EK. Your purchase of our products will be highly appreciated and much welcome! 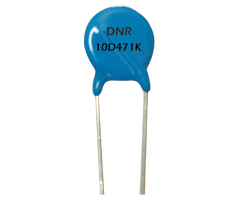 Goods of Description : Metal oxide varistor is a voltage dependent resistor with symmetrical voltage-current characteristics that is designed to protect all kinds of electronic devices or elements from switching and induced lightening surges. It's non linear exponent characteristic with broad using range and mass production is gradually being used by various level of electric engineering. Fast response time, high performance in surge current handling capability. Low leakage current, high performance in clamping voltage characteristics.